As the newest addition to Esri’s world elevation layers, WorldDEM4Ortho is part of the growing Living Atlas of the World, available in ArcGIS Online. This detailed elevation data adds to the more than 5,000 maps and layers now available to over 4 million ArcGIS users worldwide. Through multiple elevation layers that are published by Esri, this data will not only be available for end-user applications but also for developers who wish to create specific apps that are fueled with elevation information. WorldDEM4Ortho is based on the global WorldDEM dataset from Airbus and features vertical accuracy of 4 meters in a 24-meter-by-24-meter raster. Covering the earth’s entire land surface, this elevation model is the most homogenous and accurate for orthorectification data on a global scale. 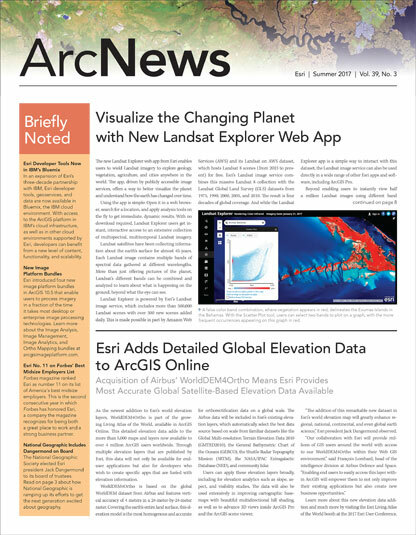 The Airbus data will be included in Esri’s existing elevation layers, which automatically select the best data source based on scale from familiar datasets like the Global Multi-resolution Terrain Elevation Data 2010 (GMTED2010), the General Bathymetric Chart of the Oceans (GEBCO), the Shuttle Radar Topography Mission (SRTM), the NASA/IPAC Extragalactic Database (NED), and community lidar. “The addition of this remarkable new dataset in Esri’s world elevation map will greatly enhance regional, national, continental, and even global earth science,” Esri president Jack Dangermond observed.